When I have an upcoming marathons, I spend a lot of time reading reviews on www.MarathonGuide.com. I also search around for other blogger’s reviews to read. 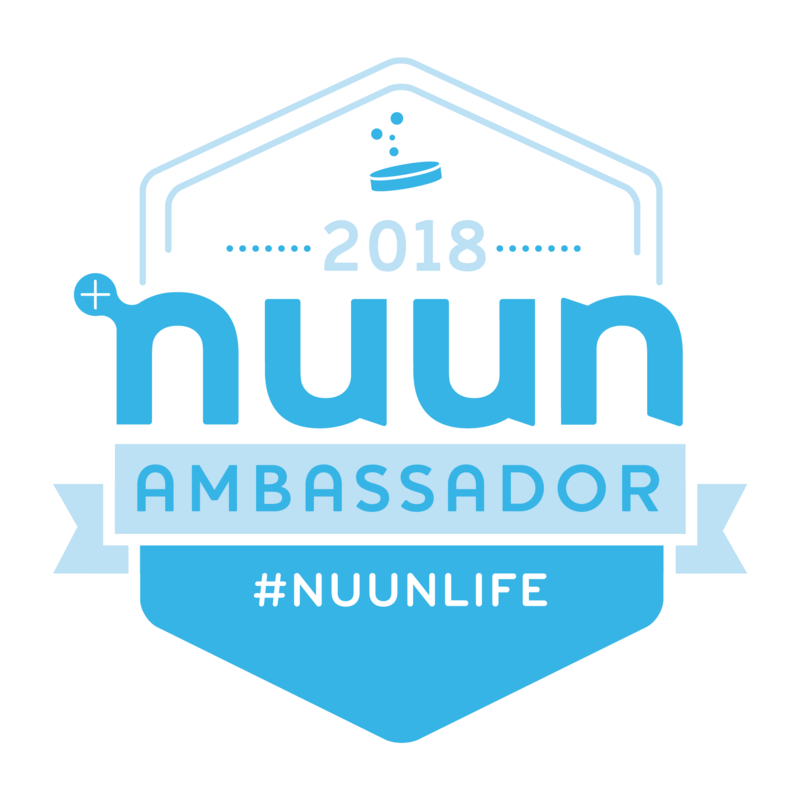 I eat up all that information, as I really value all the details that other runners share about the marathon weekend, as well as where to eat, where to stay, and what to do while in town for a marathon. With that said, I apologize in advance that my reviews are always pretty long, but I want to make sure they are as useful as possible for others who are actually doing the race! I am also going to try to make sure my review isn’t negatively affected by my poor personal performance at the marathon (4:11 when I trained all winter for a 3:45). I’ll try my best to keep this review unbiased. 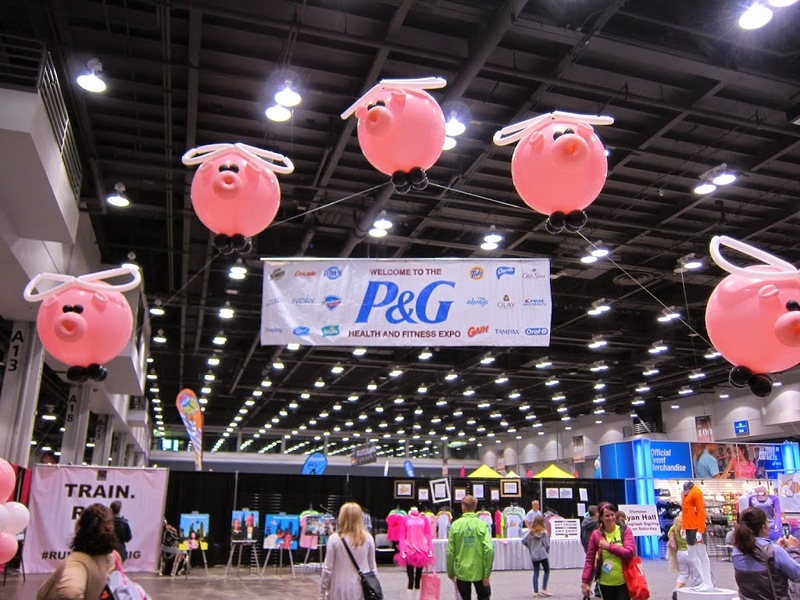 Overall, I thought the Flying Pig Marathon was a stellar marathon; it was just a challenging course and a bad personal day for me. I still recommend this marathon! The expo was held on Friday and Saturday at the Millennium Hotel ballroom and the Duke Energy Convention Center. 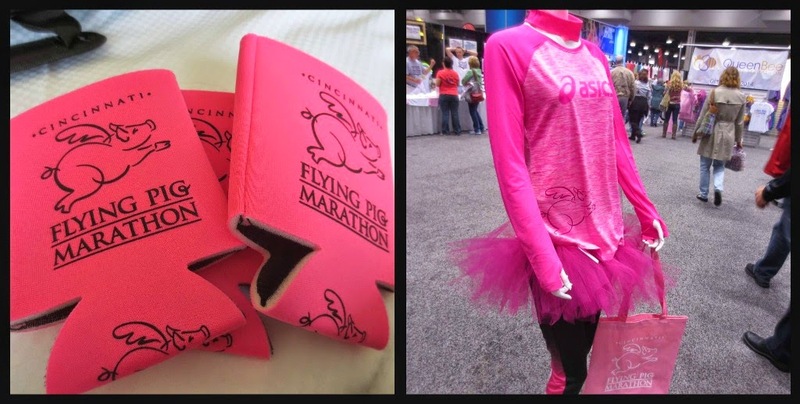 The Flying Pig Marathon is always held on the first Sunday in May. This was the first year that the expo was split into two locations. It wasn’t a big deal for us, as we were actually staying right at the Millennium Hotel, and the Duke Center was right across the street. The runner packet pickup was the only thing held at the hotel, with the rest of the expo (and t-shirt pickup) at the convention center. We went to the expo on Friday, and I’m glad we did, because it was already pretty crowded and busy. I’m sure it was even crazier on Saturday. I had read some complaints that other people did not like that you had to walk through the entire expo to get to the t-shirt pickup, but I didn’t mind this. I thought that it made the expo flow really well, as you were sort of guided along a path through all the vendors, and you never were worried that you might have missed a row. If you were entirely uninterested in checking out the vendors, you could zip through the expo right to the shirts; Yet we took our time, and pursued the goods slowly. 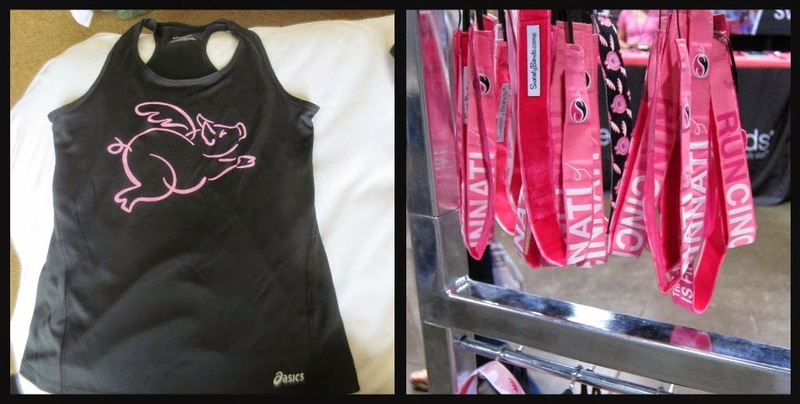 There was an expansive section of official Flying Pig gear, of which I ended up buying a BANDI headband and an Asics tank top…oh, and maybe I threw in a few can cozies! 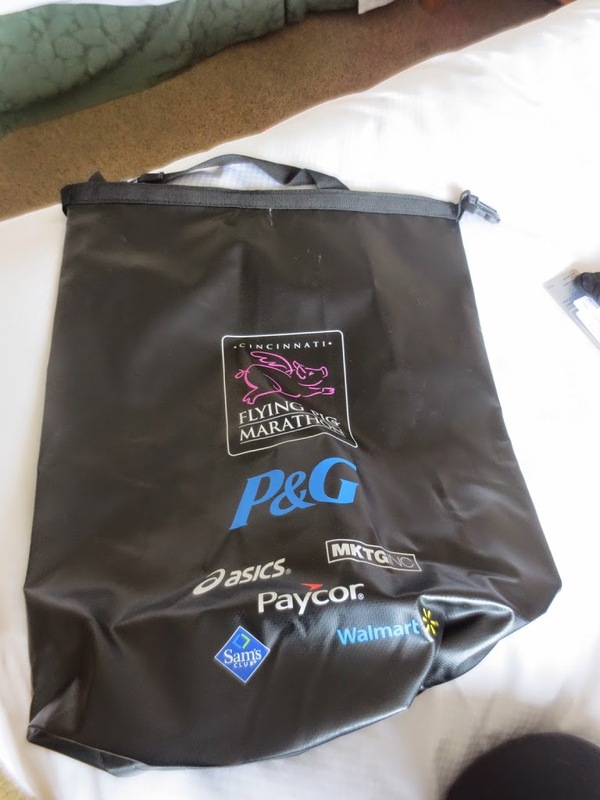 Each runner received a boxed poster and a commemorative waterproof bag, in addition to the finisher’s shirt (and awesome medal, which I’ll share later). The finisher’s shirt was a little boring. 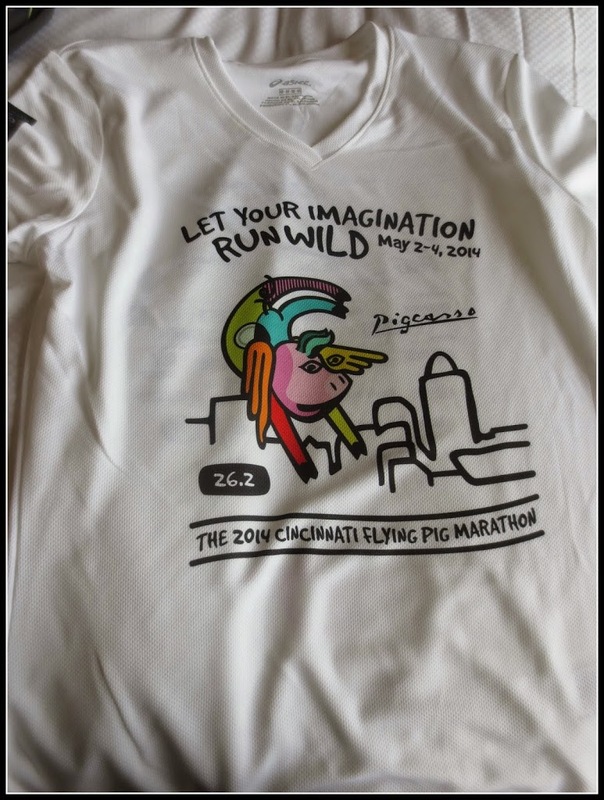 It was white with lots of sponsors listed, and there was only one word on the back that differentiated the relay runners and the half marathon runners from the full marathon runners. 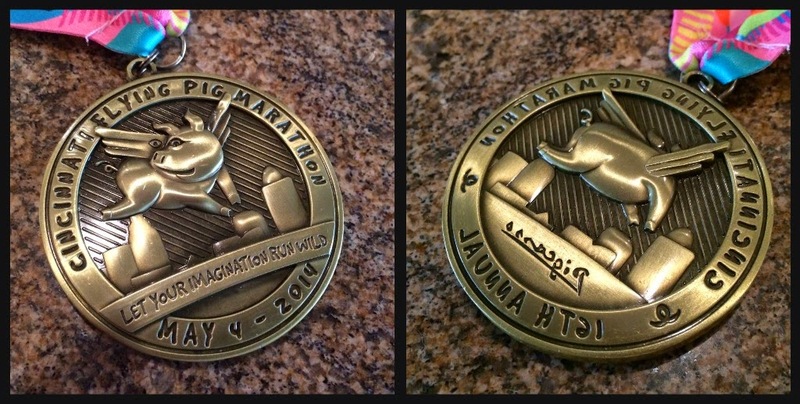 I think the full marathon runners should get a little extra recognition, don’t you? I did think the “Pigcasso” theme was cute. Overall, this was a really nice and organized expo. We didn’t have to wait a long time like we did at the Berlin Expo, and there was a lot of fun stuff to see- even a few real pigs from the zoo! but I thought it was really cute. After the expo, we had a really awesome dinner at a wood-fire pizza place called “A Travola“ in the OTR (Over-the-Rhine) neighborhood. So, so good…perfect place to eat before the race, or to celebrate after the race! Saturday, we were up relatively early to grab some breakfast, and we ended up watching a bit of the 5k and 10k events that were held that day. 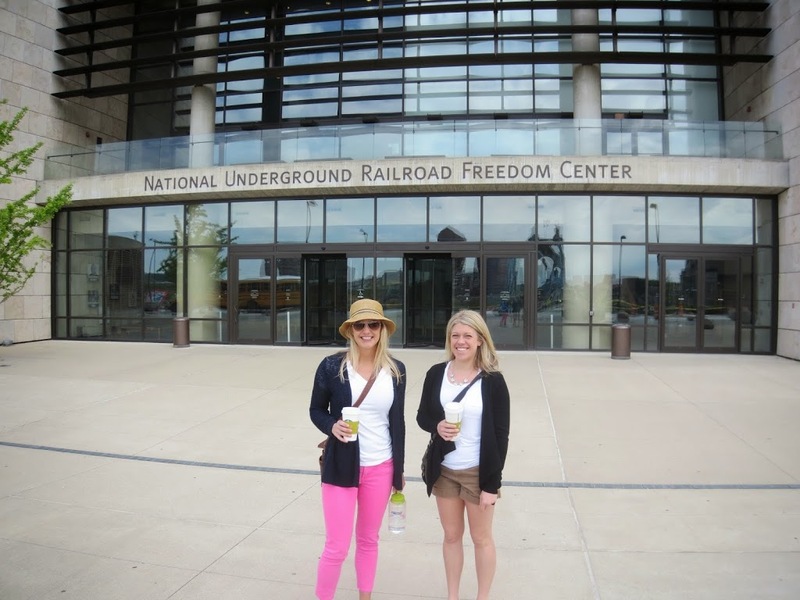 Then we headed to the Underground Railroad Freedom Center. I had read about this museum in the New York Times, in one of their “36 Hours in…” features, which usually guide us to cool places in a new city. However, unfortunately though, this museum was a bit of a disappointment. The admittance fee was $14. The actual building was really nice, but the museum had no real “flow” or a story to tell. It just seemed like it was put together without an overall theme. I feel like the exhibits were all over the place chronologically, yet a bit repetitive. We had chosen this instead of the Cincinnati Zoo (which is supposed to be quite nice) because we didn’t want to walk around too much the day before the race, but we might have been better off at the zoo. I hope my negative review doesn’t offend anyone, but I just wasn’t super impressed with this museum. I was impressed though, with the lovely Riverwalk area! We relaxed on the swings there for awhile on Saturday. After the museum, we met my sister and her family at Panera for a simple lunch, and then we went back to the hotel to relax our legs for awhile. The rooms at the Millennium were a little small, but the location was really great, especially for the marathon. We did not need a rental car, as we only used it to get to/from the airport. We could have made due with just a cab; however, had we wanted to go to the zoo or the aquarium, a car would have been helpful. I didn’t see much around though in terms of public transportation in Cincinnati. 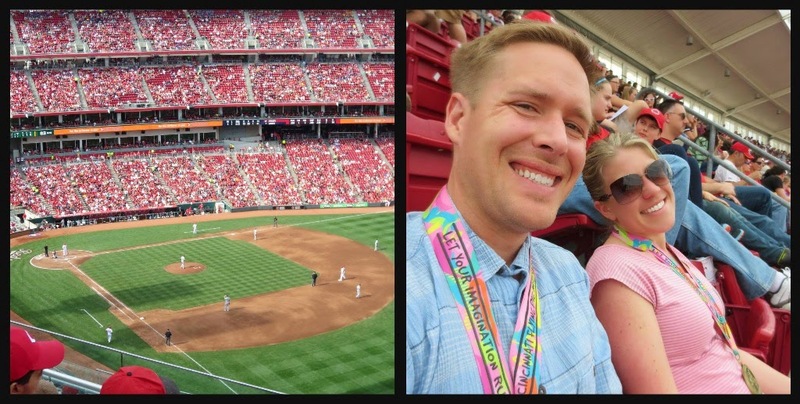 Skipping ahead to post-marathon- another fun thing to do in Cincinnati is to head to a Cincinnati Reds game! We went to one Sunday afternoon after the marathon, and it was a nice way to enjoy the sunny day. The night before the marathon, we decided to eat at the race sponsored pasta dinner. It was held near our hotel on a plaza by the river. The meal the night before the marathon is never anything memorable; I just need some simple pasta. We knew that buying tickets to the pasta feed would offer us a simple, easy-on-the-stomach dinner, with no stress. The meal was actually pretty good. There was pasta (including gluten-free if you needed it) with vegetarian or meat sauce, a salad, bread, beverages, and some live music while we ate. I must mention something unique about the corrals- the porta-potties were located in the corrals. The corrals were highly regulated by the number on your bib, fenced in and guarded so that no one could sneak into the wrong corral. Putting the bathrooms in the corrals might have seemed like a good idea, but there were just not enough of them. The lines were incredibly long. Kelly and I decided to leave our corral and found a random Porto-John at a nearly construction site instead, with a much shorter line. We barely made it back in time for the national anthem! My suggestion? Add more ports-potties, and maybe don’t have them in the corrals. Once we were back in the corral, we had to push past the still-existing lines for the bathrooms! Yes, it was warm, but the support on the course was quite amazing. There were people cheering for us along almost all of the course, except for a short part that ran on the highway towards the end. There were support stops EVERY mile, which was pretty awesome, especially on a hot day. There were also people handing out oranges at multiple places, as well as cold towels, candy, and of course, beer (I didn’t take any). 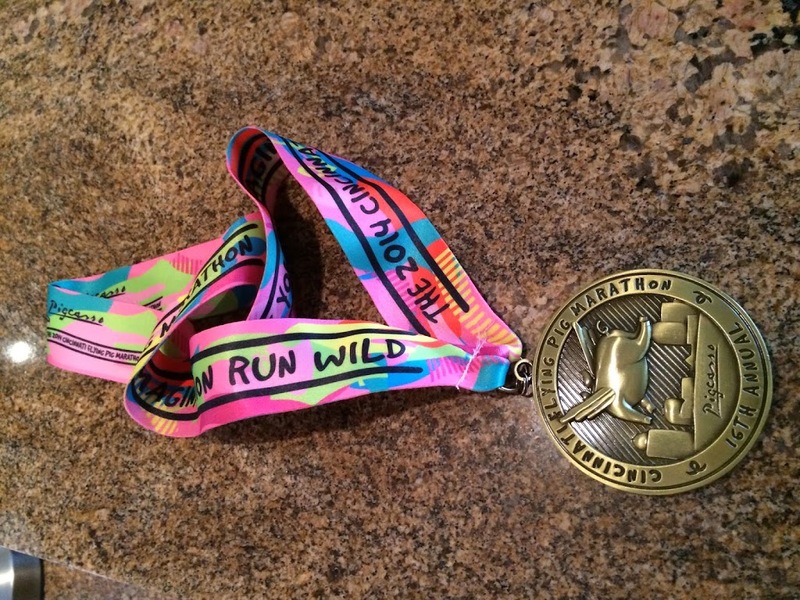 I had heard that there was a “bacon challenge” at mile 25, where you could get an extra medal for eating three pieces of bacon, but I never saw that stop. There were musicians and bands all along the course as well- elderly men singing barber shop songs, kids playing violins, an Elvis impersonator, and more! It was better than a Rock’n’Roll marathon! The finish line itself wasn’t that spectacular, and after I crossed it, it was a little hectic with both half marathoners still finishing, relay runners, and full marathoners trying to get their medals and make their way through the chute. However, after I made my way through that congested area, there was a lovely grassy park for us to rest our weary legs upon. The post-race goodies for runners were pretty standard- bananas, water, gatorade, Sun Chips, (and a Swiss Roll??) Each runner received a Michelob Ultra (I passed this time), and it felt like quite a party with live music and the warm sun on our shoulders. Oh yes- the medals! They are quite nice. 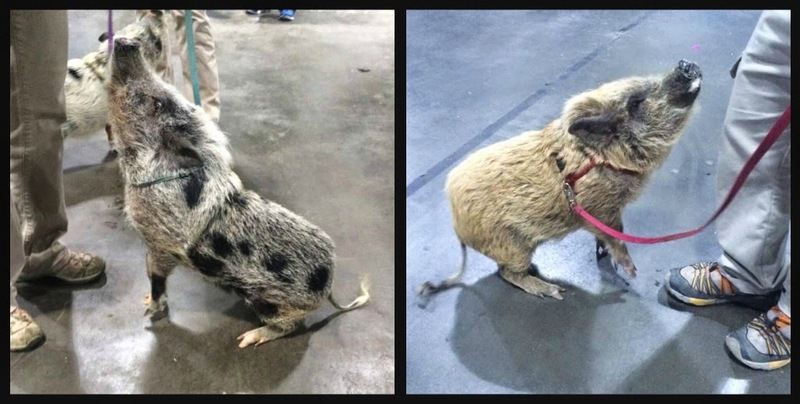 They follow along with the pig theme, with a front and back of a flying pig. So cute! 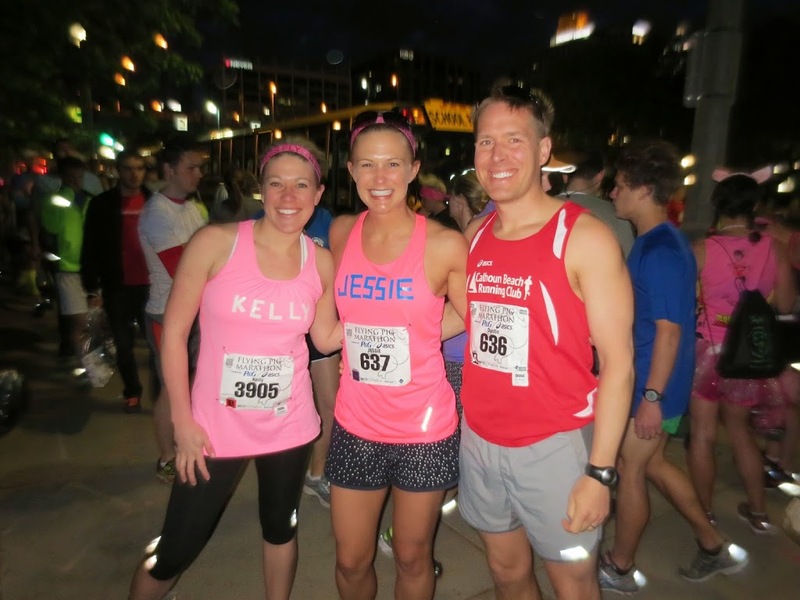 My sister Emily, her husband, and their toddler were cheering for us at the race, which was awesome! We rarely have spectators these days. She said that the course was pretty spectator-friendly. She was able to get around town by using the spectator guide from the marathon website. 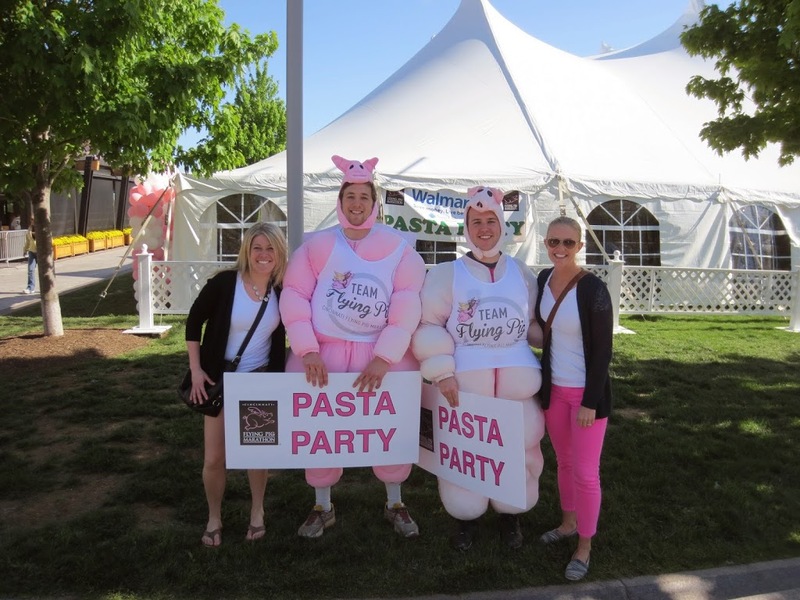 She also said that it seemed that kids really enjoyed the “pig” theme and all the fun costumes. Apparently, some of the “party zones” also handed out free food and snacks to spectators! There was also food and snacks at the finish line for spectators as well as runners. I had already come to grips with my poor marathon time throughout the run, so by the time I crossed the finish line, I didn’t think I would be too emotional about it…until I saw Dustin. Then I started to cry. Woe is me. I know, I know…Just give me my moment to wallow. I had trained really hard over a very miserable winter. I avoided injury. I ate well. I really, really pushed myself during the training. Well, tomorrow I am signed up to run the TC 1 Mile. This race is a lot of fun, and I usually try to push myself pretty hard, but my legs are just too sore for anything fast this week. If it weren’t for this race, I would not be running this week…I plan to take next week off before getting back at it. Next marathon? We’re strongly considering the OBX (Outer Banks) Marathon in North Carolina. It is a part of the country that we have never explored, and we plan to make a vacation out of it….and hopefully I’ll get back under 4 hours again. 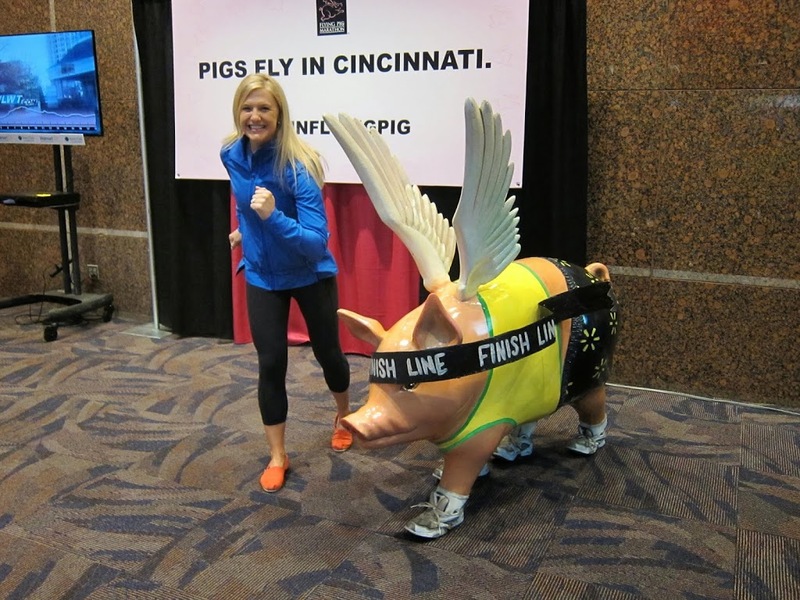 Marathon #16: Flying Pig, Cincinnati, Ohio. Complete! Grandma's Marathon Training: A Mileage Record!